but of 29 countries around the world. Check out these French expressions from all over Europe, Africa and the Americas that even the French would struggle to understand. 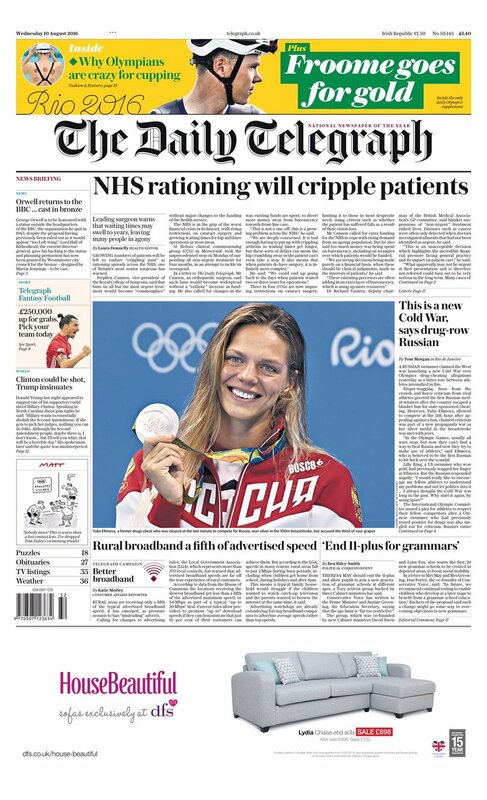 Waiting 3 to 4 Years for Surgery: The UK's State "Rationing Will Cripple Patients"
summarizes Laura Donnelly about the main story on The Daily Telegraph's front page, which, with a tongue in cheek, could be called Bravely Taking Health Care Towards a Glorious Future in the Path of Venezuela. Growing numbers of patients will be left to endure "crippling pain" as rationing spreads across the [National Health Service], one of Britain's most senior surgeons has warned. Stephen Cannon, vice-president of the Royal College of Surgeons, said that bans on all but the most urgent treatment would become "commonplace" without major changes to the funding of the health service. The NHS is in the grip of the worst financial crisis of its history, with rising restrictions on cataract surgery and growing waiting times for hip and knee operations in most areas. St Helens clinical commissioning group (CCG) in Merseyside took the unprecedented step on Monday of suspending all non-urgent treatment for four months, in an attempt to tackle overspend. … Mr Cannon, an orthopaedic surgeon, said such bans would become widespread without a "realistic" increase in funding. He also called for changes in the way existing funds are spent, to divert more money away from bureaucracy towards front-line care. Reminder: Barack Obama does not read The Daily Telegraph, in fact the most intelligent and the most outstanding and the most visionary president in modern times reads nothing but the New York Times. "This is not a one-off, this is a growing problem across the NHS," [Stephen Cannon] said. "We are deeply concerned, it is bad enough having to put up with crippling arthritis as waiting times get longer, but these sorts of delays can mean the hip crumbling away so the patient can't even take a step. It also means that when patients do have surgery, it is infinitely more complex." He said: "We could end up going back to the days when patients waited three or four years for operations." Three in four CCGs are now imposing restrictions on cataract surgery, limiting it to those in most desperate need, using criteria such as whether the patient has suffered falls as a result of their vision loss. Mr Cannon … said too much money was being spent on bureaucracy, including on wrangles over which patients would be funded. "We are seeing decisions being made purely on a financial basis, when these should be clinical judgments, made in the interest of patients," he said. "These rationing processes are often adding in an extra layer of bureaucracy, which is using up more resources." Dr Richard Vautrey, deputy chairman of the British Medical Association's GP committee, said blanket suspensions of "non-urgent" treatment risked lives. Diseases such as cancer were often only detected when doctors investigated ailments that had not been identified as urgent, he said. But as we can see, the good thing about all the above is that it leads to drama and to crises, which is of course what, in this era of the drama queen, keep the said drama queens alive, and (constantly) at the front of the scene, in the first place, as call multiply for more intervention from said drama queens, and their bureaucrats. Addendum: In another article, The Daily Telegraph reports British hospitals as saying the NHS needs to “take a reality check” and limit what it funds, in view of the fact that almost 10% of patients who go to the emergency are seen after four (!) hours (an NHS goal was for 95% of emergency patients to be seen within four hours). "We need a systematic and planned approach to this and we need to build a national consensus about what the priorities are,” he said. “We can no longer do everything with the money that we have. We have to look at all the options – whether it’s restricting access to some treatments, changing the [waiting] targets, reducing the workforce, letting the deficits slide or deciding that we can no longer keep an Accident & Emergency department open, or that we can’t run two hospitals 20 miles away from each other,” he said. The senior figure said most hospital chief executives opposed NHS charges for treatment, but many felt that greater rationing of free treatment was required, to prioritise the most essential care. The data from NHS England shows a near doubling in the numbers of elderly patients stuck in hospital, for want of care at home, or help to get them discharged, in the past five years. Overall, 115,425 bed days were lost to delayed discharges in June – almost 80 per cent more than the same month five years ago. Just 90.5 per cent of patients who went to Accident & Emergency departments were seen within four hours, against a target of 95 per cent – the worst June figures on record. Ambulance response times were also a record low for the time of year, with just 69.2 per cent of the most urgent calls receiving a response within eight minutes, against a target of 75 per cent. Charities said a funding crisis in social care meant thousands of vulnerable people were being left in hospital, when they should have been cared for in their homes. Back in the 1980s, we heard — both from within the US and from people throughout Europe — what a terrible danger America was, what a danger this reactionary president, this clueless cowboy, represented to the world, why we should instead seek to find understanding with the Soviets, who were no worse than we in the West were, they are peaceful just like (in fact, more than) we are/were (remember the Sting song? ), and why can't we all live together? In other words: The problem was not the Soviets — don't be so silly — the problem was… that horrific peril, the United States of America (or the West in general) — more specifically, those monstrous American conservatives! And the Gipper calling the USSR an "evil empire" — what a joke! Don't The Russians Love Their Children Too? After the wall came down — during which it turned out that all of Moscow's satellites couldn't get out of the Kremlin's sphere fast enough — Eastern Europe's new governments brought Soviet war plans to light: Poland "published a Warsaw Pact map showing detailed plans for Soviet nuclear strikes against western Europe" (no, not Fox News; the Guardian, the UK's most leftist daily). One Soviet military map of Denmark had "only" five targets destroyed by nuclear bombs… Others featured 27 to 52 mushroom clouds. In other words, might not the West's leftists have been wise to show a bit more skepticism with regards to Soviet-signed treaties and to the Kremlin's assurances of peaceful intentions? Of course, hasn't the above been the apologizer-in-chief's main contention for 8 years: that nobody is America's enemy, nobody is the world's enemy, except for… America itself, specifically its despicable conservative extremists? And so we cozy up to countries like Cuba and Iran; don't the Cubans and the Iranians love their children too? Oh, Obama's Iran move is no big deal; remember, it was Iran's money to begin with; it was just unfrozen; the Iranian nuclear program has been stopped. This is The Russians Love Their Children Too narrative. This is again the "it's all (or mostly) America's fault" scenario. As for Iran's nuclear program having been stopped, where have we heard that before? Oh right, in the 1990s, when another non-warmongering president in the White House sent a previous non-warmongering president to Pyongyang to "successfully" negotiate the end of North Korea's nukes. In other words, 12 years after this historic deal, Pyongyang showed that it had never had any to follow the piece of paper it duly signed, whether in spirit or in letter — and, as it were, that it had never had any respect for America or, for that matter, for any of America's politicians, especially the two presidents involved in the deal. Are we allowed to ask the following question: What does the Iran deal bode for, say, 2028? And how does it feel to get lectured by a Saudi citizen? Meanwhile, Cuba was never asked to release a single political prisoner (indeed, Americans were told that they have lessons to learn from the Castro brothers' single-party political system) while Iran's Green Movement was allowed to be ruthlessly suppressed in 2009 with not a peep from the White House. 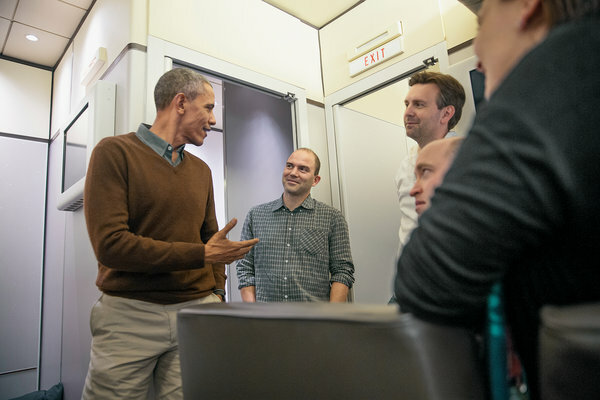 Must we ignore the New York Times magazine's interview with Ben Rhodes, Obama’s deputy national security adviser for strategic communications — or as they dub him, “The Aspiring Novelist Who Became Obama’s Foreign-Policy Guru,” who all but tells the Grady Lady that their reporting — and that the news we all of us read to stay informed — is basically worthless? In Rhodes's "narrative" about the Iran deal, negotiations started when the ostensibly moderate Hassan Rouhani was elected president, providing an opening for the administration to reach out in friendship. In reality, as [the NYT's David Samuels] gets administration officials to admit, negotiations began when "hardliner" Mahmoud Ahmadinejad was still president. It was Rhodes who framed the Iran deal as a choice between peace and war, and it was Rhodes who set up a messaging unit to sell the deal that created an "echo chamber" in the press. legions of arms-control experts began popping up at think tanks and on social media, and then became key sources for hundreds of often-clueless reporters. "We created an echo chamber," [Rhodes] admitted, when I asked him to explain the onslaught of freshly minted experts cheerleading for the deal. "They were saying things that validated what we had given them to say." Gleefully blowing raspberries at U.S. conservatives: another example of geniuses knowing who America's, and who the world's, true enemies are! And isn't that what Obama's policies, domestic as well as foreign, have been all about for the past eight years? … as William Jacobson of Legal Insurrection writes about Obama's maximum Kinsley-esque gaffe, "Obamaphiles can’t have it both ways. "Either, as they say, he’s the most brilliant speech writer ever who carefully crafts his texts to bring forward historical analogies — in which case he used the phrase deliberately which is frightening – or he’s way overblown and did it without realizing the significance." How has this wonderful new "smart diplomacy" worked out? How about that Obama and Hillary reset with Russia (now that Russian warplanes buzz U.S. Navy vessels)? Four years ago, Mitt Romney was mocked by Obama — and rebuked by, among others, the New York Times — for calling Russia America's "No. 1 geopolitical foe." "The 1980s, they're now calling to ask for their foreign policy back" sneered Barack Obama, "because, y'know, the Cold War's been over for 20 years." writes Geoffrey Pullum (for the evidence, see the Lingua Franca blogger's article “Fear and Loathing of the English Passive“; thanks to Eugene Volokh). So when I encounter a book that’s a bit better than the average, as I recently did, it’s only fair that I should comment. The Handbook of Good English (1982), by Edward D. Johnson, also known as The Washington Square Press Handbook of Good English, is a bit more sensible on the topic than most works addressed to the general public in the past half century. When does the passive express a shade of meaning that the active doesn’t? In what could be called the finger-pointing use of long passives. A passive with a by-phrase lays stress on the agent. In The money was stolen by a man, judging from those footprints, Johnson points out, the passive ensures that the agent (a man) is at the end of its clause, where it naturally receives stress. The active (a man stole the money) would be stylistically worse. And when is the passive more compact and direct? One class of such cases comprises Johnson’s “trouble-saving passive.” If you were to take a sentence like Smith was arrested, indicted, and found guilty, but the money was never recovered and try to wrestle it into the active voice, as so many writing guides insist you should, you would have to find subjects for all the active verb phrases. You’d need subjects for arrested Smith (the police department? the county sheriff? ), and indicted him (a grand jury, as in the U.S.? the Crown Prosecution Service, as in Britain? ), and for found him guilty (a judge? a trial jury? ), and for recovered the money (the detectives? some bank or post office? the people whose cash had been stolen?). Implementing this pointless and clumsy elaboration would make the sentence nearly twice as long. This is all true. In fact it seems hardly fair to call it pussyfooting. Consider the Wikipedia article on John F. Kennedy: Section 7 begins: “President Kennedy was assassinated in Dallas, Texas … “; “he was shot once in the back,” and so on. Using an active with Lee Harvey Oswald as the subject at this point would be a distracting and pointless anachronism (Oswald has no place in the narrative of the shooting and the minutes following it). The passive is exactly the right choice. … this is where modern American writing instruction has brought us. Totally unmotivated warnings against sentences that have nothing wrong with them are handed out by people who (unwittingly) often use such sentences more than the people they criticize. … It’s the blind warning the blind about a nonexistent danger.